Lombard Forte Securities Limited (formerly known as Wallich and Matthes Dubai Limited) was established in 2007 and is regulated by the Dubai Financial Services Authority. Lombard Forte Securities Limited provides both voice and electronic broking services delivered in a bespoke fashion to meet the requirements of our diverse range of clients. As an inter-dealer broker we specialise in Equities, Fixed Income Bonds and Equity Derivatives. As a privately held company Lombard Forte is able to focus on innovation and building solid business relationships and The Middle East is seen as a very important area of growth for the company. We offer our clients price discovery in the area of Emerging Markets Equity Derivatives. Consistently amongst the top brokers in this market our expertise and experience in this sector is unrivalled. With a large team and a client list that includes every significant market participant, we are in an excellent position to cater to the needs of a fast paced, highly competitive market, that demands up to date and accurate price discovery, as well as prompt and seamless access. Lombard offers a high standard of price discovery and liquidity provision services on all major European exchanges. Years of experience in the equity derivatives space makes us well placed to satisfy the requirements of traders across a wide range of institutional profiles and geographical locations. In addition to back to back arranging, our experienced traders offer facilities for non-member clients on a range of exchanges. Our Middle East and Africa fixed income desk provides over the counter accces for bonds, sukuk and credit default swaps via both traditional voice broking and electronic broking channels. Lombard Forte differentiates itself by restricting its client base strictly to the regional and international professional sell-side banks. This platform provides a secure trading environment that makes a clear distinction between our client base and our liquidity providers client base. We are able to offer the highest standards of execution in pan European and North American cash equities in an efficient and cost effective manner. Through our joint venture with Lombard Invest Africa we are able to provide research and access to all major African markets. Lombard prides itself on its ability to cater for a diverse range of asset classes and structures. Our strength lies in our flexibility and substantial experience and knowledge base, allowing us to structure and implement bespoke services in time critical sectors. Along side our regular flow broking activities, we also provide specialist and bespoke services to people who require expertise in niche areas. Ranging from private equity ventures to international trade finance, Lombard can offer exciting and effective solutions. With a particular focus on Africa, the team can leverage its experience and contact base to provide expertise in investments into sub-Saharan Africa. Russia, Turkey, Poland, Middle East – Primary focus on market-based transactions. Over the counter execution for Middle East and Africa bonds, sukuk and credit default swaps via both traditional voice broking and electronic broking channels. Primary focus on market based transactions. Each time you use or enter http://lombardforte.com/ (hereinafter referred to as the “Lombard Forte Website”) and by continuing to access or use the Lombard Forte Website, you expressly acknowledge and agree to the terms and conditions set out below in this Disclaimer, as well as the Privacy Statement and Website Terms and Conditions that may be found on the Lombard Forte Website. Services contained and mentioned in the Lombard Forte Website are not relevant to nor available to retail clients, therefore the Lombard Forte Website and any information or documents within this site are only available to professional clients and market counterparties as defined by the DFSA accept where we provide a public information source. The distribution of the information contained in the Lombard Forte Website in certain countries may be restricted by law and persons who access it are required to inform themselves and to comply with any such restrictions. The “Lombard Forte Website” is published and provided solely for informational purposes with no regard to the financial situation or particular needs of any legal person and, unless otherwise indicated, is not intended to, and shall not, constitute an offer or acceptance with the respect to any transactions or other matters. Although the information provided to you on the Lombard Forte Website is obtained or compiled from sources we believe to be complete, accurate and up to date, Lombard Forte Securities Limited cannot and does not guarantee the accuracy, validity, views and opinions, or timeliness of any information or data made available to you for any particular purpose. The Lombard Forte Website is provided “AS IS” without any warranty of any kind, express or implied, including, but not limited to, any implied warranty of merchantability, fitness for a particular purpose, accuracy or completeness of the information contained on this Lombard Forte Website or in respect of any materials or products referred to on this Lombard Forte Website, or non-infringement. Difficulties in use of this Lombard Forte Website could involve, among others, failures, delays, malfunction, software erosion, inadvertent disclosure of information provided to Lombard Forte Securities Limited via this Lombard Forte Website, or hardware damage, which difficulties could be the result of hardware, software or communication link inadequacies or other causes. Such difficulties could lead to possible economic and/or data loss. Lombard Forte Securities Limited does not warrant that the Lombard Forte Website is compatible with your equipment or that the Lombard Forte Website is free of errors, viruses or worms. In no event shall Lombard Forte Securities Limited be liable for any damage you may suffer as a result of such destructive features. All warranties, whether express or implied, are hereby excluded to the extent permitted by law. This Lombard Forte Website and any information and material which it contains are subject to change at any time by Lombard Forte Securities Limited without prior notice to you so you should review these terms and conditions whenever accessing or using the Lombard Forte Website. By using the Lombard Forte Website, after the posting of modifications to this Disclaimer and the Privacy Statement and Website Terms and Conditions, you signify your acceptance of such changes related to the aforementioned documents and the Lombard Forte Website, as modified. You may not use this Lombard Forte Website if, at any time, you do not wish to accept the terms and conditions as set forth in this Disclaimer, the Privacy Statement and Website Terms and Conditions. Lombard Forte Securities Limited reserves the right to suspend, terminate or restrict your access to or use of this Lombard Forte Website. All information and material including templates/images and text and on the Lombard Forte Website is the property of Lombard Forte Securities Limited and is subject to copyright. Any trademarks on this Lombard Forte Website are the property of their respective owners. You are entitled to view, copy and print any documents from the Lombard Forte Website but only for your own internal business purposes. You acquire absolutely no rights or licenses in or to the Lombard Forte Website or the materials contained within the Lombard Forte Website other than the limited right to use the Lombard Forte Website in accordance with this Disclaimer. Any sale, transmission or redistribution of the Lombard Forte Website or its content, and any copying, modification or other use of the Lombard Forte Website or its content for any purposes other than your own internal business purposes, are strictly prohibited. All present and future rights in and to trade secrets, trademarks, service marks, copyrights and other proprietary rights under the laws of any domestic or foreign governmental authority (the “Intellectual Property Rights”) shall at all times be and remain the sole and exclusive property of Lombard Forte Securities Limited. Except as specifically permitted herein, you shall not use the Intellectual Property Rights or the Lombard Forte Website, or any derivations thereof, for any purpose, without Lombard Forte Securities Limited express and prior written approval. You agree to protect the proprietary rights of Lombard Forte Securities Limited and to comply with all reasonable written or electronic requests made by Lombard Forte Securities Limited or its suppliers of content or otherwise (“Suppliers”) to protect their and others’ contractual, statutory and common law rights in the Lombard Forte Website. You agree to provide Lombard Forte Securities Limited with prompt written notice of any unauthorized access or use of the Lombard Forte Website by any party or of any claim that the Lombard Forte Website infringes upon any copyright, trademark or other contractual, statutory or common law rights. YOU MAY NOT COPY, REPRODUCE, RECOMPILE, DECOMPILE, DISASSEMBLE, REVERSE ENGINEER, DISTRIBUTE, PUBLISH, DISPLAY, PERFORM, MODIFY, UPLOAD TO, CREATE DERIVATIVE WORKS FROM, TRANSMIT OR IN ANY WAY EXPLOIT ALL OR ANY PART OF THE LOMBARD FORTE WEBSITE, EXCEPT AS EXPRESSLY PROVIDED IN THIS DISCLAIMER AND THE WEBSITE TERMS AND CONDITIONS OF USE. THE CONTENTS OF THE LOMBARD FORTE WEBSITE MAY NOT BE RECIRCULATED, REDISTRIBUTED OR PUBLISHED BY YOU WITHOUT LOMBARD FORTE SECURITIES LIMITED’S EXPRESS PRIOR WRITTEN CONSENT. IF YOU DOWNLOAD ANY INFORMATION FROM THE LOMBARD FORTE WEBSITE, YOU AGREE THAT YOU WILL NOT COPY IT OR REMOVE OR OBSCURE ANY COPYRIGHT OR OTHER NOTICES OR LEGENDS CONTAINED IN ANY SUCH INFORMATION. MODIFICATION OF THE LOMBARD FORTE WEBSITE CONTENT WOULD BE A VIOLATION OF LOMBARD FORTE SECURITIES LIMITED’S COPYRIGHT AND OTHER PROPRIETARY RIGHTS. YOU MAY NOT USE THE LOMBARD FORTE WEBSITE FOR ANY ILLEGAL PURPOSE OR IN ANY MANNER INCONSISTENT WITH APPLICABLE LAW OR THIS DISCLAIMER AND THE WEBSITE TERMS AND CONDITIONS OF USE. YOU MAY NOT OFFER ANY PART OF THE LOMBARD FORTE WEBSITE FOR SALE OR DISTRIBUTE IT OVER ANY OTHER MEDIUM INCLUDING BUT NOT LIMITED TO INTERNET, TELEVISION OR RADIO BROADCAST, A COMPUTER NETWORK OR HYPERLINK FRAMING ON THE INTERNET WITHOUT THE PRIOR EXPRESS WRITTEN CONSENT OF LOMBARD FORTE SECURITIES LIMITED. YOU MAY NOT USE ANY OF LOMBARD FORTE SECURITIES LIMITED’S TRADEMARKS, OR TRADE OR BUSINESS NAMES IN A MANNER THAT SUGGESTS THAT SUCH NAMES AND MARKS BELONG TO OR ARE ASSOCIATED WITH YOU OR ARE USED WITH LOMBARD FORTE SECURITIES LIMITED’S CONSENT, AND YOU ACKNOWLEDGE THAT YOU HAVE NO OWNERSHIP RIGHTS IN AND TO ANY OF THESE NAMES AND MARKS. YOU WILL NOT USE THE LOMBARD FORTE WEBSITE OR THE INFORMATION CONTAINED THEREIN IN UNSOLICITED MAILINGS OR SPAM MATERIAL. YOU WILL NOT SPAM OR SEND UNSOLICITED MAILINGS TO ANY PERSON OR ENTITY USING THE LOMBARD FORTE WEBSITE. YOU AGREE TO COMPLY WITH ANY OTHER APPLICABLE TERMS AND CONDITIONS OF USE SET FORTH ON THE LOMBARD FORTE WEBSITE. You must not transmit any virus or other item of a destructive nature to the Lombard Forte Website, and it is the user’s responsibility to ensure that whatever users download or select for the users to use from the site is free from such items. This Lombard Forte Website may provide links to certain website by third parties (“Third Party Websites“). Such Third Party Websites are publicly available and Lombard Forte Securities Limited is providing access to such Third Party Websites through this Lombard Forte Website solely as a convenience to you. Third Party Websites are not reviewed, controlled or examined by us and we are not responsible for the information, advertising, products, resources or other materials, of any linked site or any link contained in a linked site. The inclusion of any link does not imply any endorsement whatsoever by Lombard Forte Securities Limited. In addition, please be aware that your use of any linked site is subject to the terms and conditions applicable to that website. Lombard Forte Securities Limited do not intend the information provided on this site to be distributed to, or used by, any person or entity in any jurisdiction or country where such distribution or use would be contrary to law or regulation or which would subject Lombard Forte Securities Limited or its affiliates to any registration requirement within such jurisdiction or country. Neither the information, nor any opinion contained in this site constitutes a solicitation or offer by Lombard Forte Securities Limited or its affiliates to buy or sell any securities, futures, options or other financial instruments or provide any investment advice or service. Lombard Forte Securities Limited cannot be held responsible for any damages or losses that occur from transactions and/or services in defiance of the relevant rules of the user’s home jurisdiction. Lombard Forte Securities Limited and its directors, officers, employees and agents shall, to the extent permitted by law, have no liability, contingent or otherwise, whether caused by the negligence of Lombard Forte Securities Limited, its employees, subcontractors, agents, Suppliers, or otherwise, to you or to third parties for the accuracy, timeliness, completeness, reliability, performance or continued availability of this Lombard Forte Website or for delays or omissions therein, including, but not limited to, inaccuracies or errors in or omissions from quotes and financial data. Lombard Forte Securities Limited shall have no responsibility to maintain the information or services made available on this Lombard Forte Website or to supply any corrections or updates in connection with such information or services. Nothing set forth in this Lombard Forte Website should be construed as a recommendation to purchase or sell any product or instrument or to enter into any transaction, or as a representation that any particular product or instrument is suitable or appropriate for you. Products described in this Lombard Forte Website may involve significant risks and you should not enter into any transactions unless you fully understand all of these risks and have independently determined that the risks are acceptable to you and that the transactions are appropriate for you in light of your objectives, experience, financial and operational resources and other relevant circumstances. Any discussion of risks contained in this Lombard Forte Website, however, should not be considered to be a disclosure of the risks of particular transactions, or a complete discussion of the risks which are mentioned. You should not construe any of the material contained in this Lombard Forte Website as business, financial, investment, hedging, trading, legal, regulatory, tax or accounting advice and you should not make this Lombard Forte Website the primary basis for any trading decisions. In providing this Lombard Forte Website and upon entering into any transactions in the products described in this Lombard Forte Website, Lombard Forte Securities Limited is acting solely in the capacity of an arm’s length contractual counterparty and not as a financial advisor or a fiduciary. Under no circumstances should Lombard Forte Securities Limited be considered your advisor or fiduciary and, if you require advice with respect to the products identified in this Lombard Forte Website or any contemplated transactions, you should consult your own business, financial, accounting or legal advisors. In no event will Lombard Forte Securities Limited, nor any of its affiliates, trading names, directors, officers or employees, nor any third party vendors be liable to you for any direct, special, indirect, incidental, punitive or consequential damages (including, without limitation, loss of business, loss of profit, loss or corruption of data, loss of goodwill or reputation or wasted management time) which may be incurred or experienced on account of your using or relying upon this Lombard Forte Website or any information or link on it, even if Lombard Forte Securities Limited has been advised of the possibility of such damages or the respective contents; or otherwise arising in connection therewith or that you incur in the event of any failure or interruption of the Lombard Forte Website; or resulting from the act or omission of any other party involved in making this site or the data contained therein available to you; or from any other cause relating to your access to, inability to access, or use of the site or these materials, whether or not the circumstances giving rise to such cause may have been within the control of Lombard Forte Securities Limited or of any vendor providing software or services. Any limitations or restrictions on liability in this Disclaimer shall only apply to the extent permitted by applicable law. In no event shall the total liability of Lombard Forte Securities Limited to you for all damages, losses and causes of action (whether in contract or tort, including but not limited to, negligence) exceed the amount paid by you to Lombard Forte Securities Limited, if any, for accessing this Lombard Forte Website. You agree, at your own expense, to indemnify, defend and hold harmless Lombard Forte Securities Limited and its employees, representatives, Suppliers and agents, against any claim, suit, action or other proceeding against Lombard Forte Securities Limited, its employees, representatives, Suppliers and agents, by a third party, to the extent that such claim, suit, action or other proceeding is based on or arises in connection with your use of the Lombard Forte Website, or any links on the Lombard Forte Website, including, but not limited to: (i) your use or someone using your computer’s use of the Lombard Forte Website; (ii) your use or someone using any password you may obtain; (iii) a violation of the terms set forth in this Disclaimer by you or anyone using your computer or password; (iv) a claim that any use of the Lombard Forte Website by you or someone using your computer or password infringes any intellectual property right of any third party, is libellous or defamatory, or otherwise results in injury or damage to any third party; (v) any deletions, additions, insertions or alterations to, or any unauthorised use of, the Lombard Forte Website by you or someone using your computer or password; (vi) any misrepresentation or breach of representation or warranty made by you contained herein; or (vii) any breach of any covenant or agreement to be performed by you hereunder. You agree to pay any and all costs, damages and expenses, including, but not limited to, reasonable legal fees and costs awarded against or otherwise incurred by or in connection with or arising from any such claim, suit, action or proceeding attributable to any such claim. A condition of your browsing and using the Lombard Forte Website is that in the event of any enforcement of terms, dispute or proceeding (and any non-contractual disputes or claims) you irrevocably submit to the exclusive jurisdiction of the DIFC Courts and waive any objection to proceedings in such courts on the grounds of venue or on the grounds that the proceedings have been brought in an inconvenient forum. 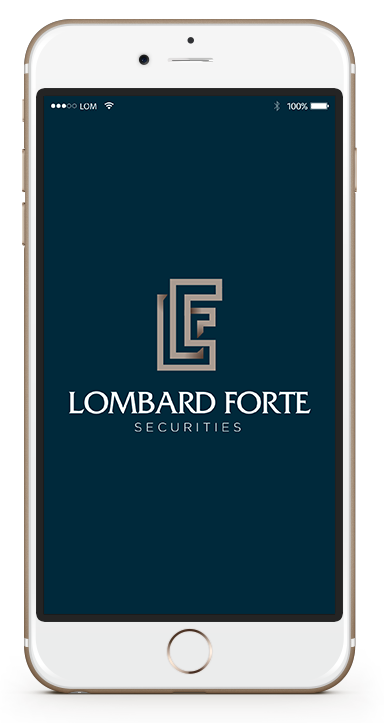 The Lombard Forte Securities Website (“Lombard Forte Website”) is issued in the United Arab Emirates by Lombard Forte Securities Limited which is authorised and regulated by the DFSA (F000284). Lombard Forte Securities Limited is a company incorporated in the Dubai International Financial Centre, United Arab Emirates (registered no. 356, registered office: Unit 01, Level 2, Currency House – Building 1, Dubai International Financial Centre, Dubai, 482097, United Arab Emirates). Authorised and Regulated by the Dubai Financial Services Authority.